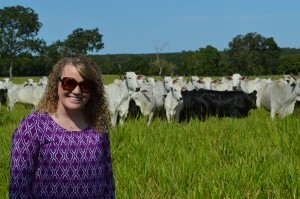 Cheyenne Moyer, a first semester master’s student in agricultural education, was part of a group of K-State students who traveled to Brazil this summer to learn about livestock production, management and processing practices, and experience the culture of Brazil. Moyer traveled to several beef cattle breeding and production operations, beef feedlots, a meat processing facility, a reproductive facility and several large integrated cropping and livestock enterprises. “Right now they [Brazil] are the second largest beef industry right behind the U.S. and with just a few more advances in technology and genetics there is no reason that they couldn’t be number one in just a few years,” says Moyer. Moyer visited farmers and ranchers and toured genetics facilities utilizing in-vetro fertilization, embryo transfer and cloning. Students spent their free time by going fishing and swimming in some of the waterfalls and rivers and sampling Brazilian cuisines. 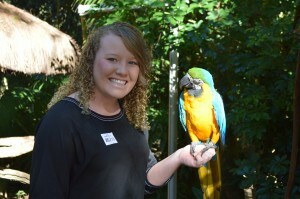 Cheyenne was one of several students to receive a scholarship to fund her trip to make it more affordable. “If given the opportunity I would definitely go back to Brazil and I would like to go to New Zealand and Australia too”, says Moyer.